SpaceX's Falcon 9 rocket and Dragon spacecraft stand poised to launch on the fifth cargo delivery mission to the International Space Station for NASA on Jan. 6, 2015. That attempt was scrubbed, and the next try is set for Jan. 10. SpaceX has delayed its next robotic cargo launch toward the International Space Station — which will also feature a bold rocket-reusability test — by another day, to early Saturday morning (Jan. 10). 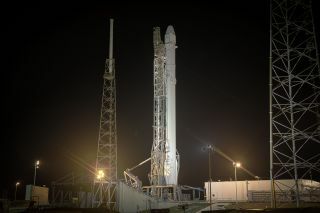 SpaceX's Falcon 9 rocket and Dragon capsule are now scheduled to blast off from Cape Canaveral Air Force Station in Florida at 4:47 a.m. EST (0947 GMT) Saturday. You can watch the launch live here on Space.com, courtesy of NASA TV and SpaceX, beginning at 3:30 a.m. EST (0830 GMT). The launch — which will kick off SpaceX's fifth contracted supply mission to the space station for NASA — was targeted for Tuesday (Jan. 6), but that attempt was scrubbed just before liftoff because of an issue with an actuator on the Falcon 9's second stage. SpaceX initially pushed the launch to Friday morning (Jan. 9), which was the next available opportunity, and today (Jan. 7), decided to delay it another 24 hours. The primary objective of the launch is to send the unmanned Dragon — which is loaded with more than 5,000 lbs. (2,270 kilograms) of food, scientific experiments and spare parts — on its way to the orbiting lab. But SpaceX will also try to bring the Falcon 9's first stage back to Earth for a pinpoint landing on a floating platform in the Atlantic Ocean. The unprecedented rocket-landing test is part of SpaceX's effort to develop fully and rapidly reusable rocket technology — a key priority of the company and its billionaire founder, Elon Musk. If Dragon does get off the ground on Saturday, the capsule will arrive at the space station early Monday morning (Jan. 12), NASA officials said. Dragon will stay at the orbiting lab for a month, and then return to Earth for a splashdown in the Pacific Ocean. SpaceX holds a $1.6 billion contract with NASA to complete 12 cargo runs to the space station. The space agency also signed a $1.9 billion deal with Virginia-based Orbital Sciences Corp. to fly eight such missions using the company's Cygnus spacecraft and Antares rocket. Orbital's first two flights went well, but the third was lost in late October when Antares exploded shortly after liftoff.